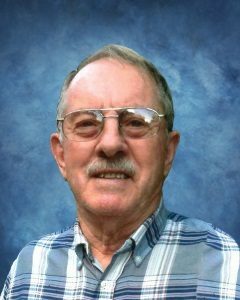 Dean DeNolan Mundahl, age 86, of Hutchinson, Minnesota, passed away Tuesday, January 22, 2019, at Harmony River Living Center in Hutchinson. A Mass of Christian Burial will be held on Saturday, February 9, 2019, at 11:00 A.M. at Saint Anastasia Catholic Church in Hutchinson with interment in Saint Anastasia Catholic Cemetery in Hutchinson. Visitation will be held on Saturday, February 9, 2019, at 10:00 A.M., for one hour prior to the service, at the church. Military Honors by Hutchinson Memorial Rifle Squad. Dean DeNolan Mundahl was born on November 6, 1932, in Bemidji, Minnesota. He was the son of Hans and Edna (Brown) Mundahl. Dean was baptized as an infant into the Christian Faith. He was later confirmed in his Catholic faith at St. Clements Catholic Church in 1955 in NE Minneapolis, Minnesota. He received his education in Bemidji, MN and was a graduate of the Bemidji High School Class of 1950. He furthered his education at the Minnesota School of Business, earning his Business Administration Degree. Dean entered active military service in the United States Air Force on December 8, 1950, in Minneapolis. He served his country during the Korean War and was stationed in Korea. Dean received the Korean Service Medal, Good Conduct Medal, United Nations Service Medal and the National Defense Service Medal. He received Honorable Discharge on September 16, 1954, at Kirtland Air Force Base, New Mexico, achieving the rank of Airman First Class. On June 9, 1956, Dean was united in marriage to Margarete Szutz at Saint Clements Catholic Church in North East Minneapolis. This marriage was blessed with three children, Mark, Diane and David. Dean and Margarete resided in Wadena, Minnesota, Fergus Falls, Minnesota, Davenport, Iowa, Cedar Rapids, Iowa, and Alexandria, Minnesota. Dean and Margarete shared 62 years of marriage. Dean was employed in college at Snyder Drug Store in North East Minneapolis, where he met his future wife, Margarete Szutz. He was then employed with Amoco Oil Company (Standard Oil of Indiana) as a Territory Manager. It was there that he worked for 33 years, before retiring on July 1, 1990. Dean served as past president of the School Board at Our Lady of Victory Catholic School in Fergus Falls, Minnesota and was a member of the Knights of Columbus. He also held membership with the American Legion Post #0268 in Kensington, Minnesota. Dean enjoyed the outdoors, hunting, fishing, camping and traveling. He also enjoyed candle making and sharing cotton candy with family and neighbors from his vintage cotton candy machine. Dean obtained his Pilot’s License and enjoyed caring for his aircraft. He built three lake homes, doing most of the work himself. During retirement, Dean enjoyed life on the lake and spent winters in Sun City, Arizona. He learned the art of wood carving and carved many beautiful projects for family and friends. Dean especially cherished time spent with his family, grandchildren and friends. Dean was a loving Husband, Father and Grandfather. His joy was to share life experiences, stories and words of wisdom with his family. Dean was a great motivator to his family and had high expectations of his children and grandchildren. He touched many lives and will be dearly missed by family and friends. Dean passed away on Tuesday, January 22, 2019, at Harmony River Living Center in Hutchinson, Minnesota at the age of 86 years. Dean is preceded in death by his Parents, Hans and Edna Mundahl; Sister, Deloris Utech and her husband, Wallace; Brother-In-Law, Everett Casto; Sisters-In-Law, Maggie Eckenroth and Maria Homstad. My deepest sympathy to all. It’s been a bitter sweet time spent with Dean. What a great guy he was to anyone he met. I am so glad we had the happy times together. We will miss you Dean. Hugs to you Margarete, Diane and families. Uncle Dean was a great man and a wonderful uncle that any boy could have. We always looked forward to Uncle Dean and Aunt Margarete when they came to Oklahoma. He will be missed.